Berlin and Windhoek have been partner cities since 2000. 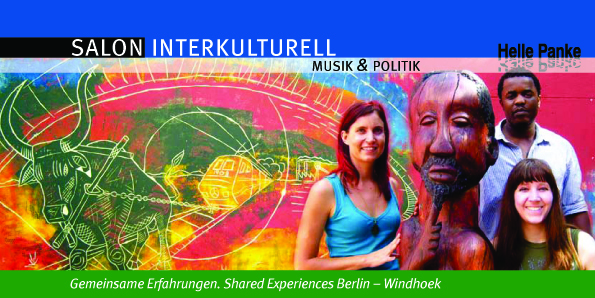 The non-profit organization p.art.ners berlin-windhoek gGmbH was founded in 2007 as a private initiative by Namibian artist Imke Rust and Berlin parliamentarian Oliver Schruoffeneger, to promote art and cultural exchange within this city partnership and strengthen the existing ties. The ‘shared experiences’ projects, organized by p.art.ners berlin-windhoek, aim to promote artists through exchange and exposure. In close collaboration with Namibian and Berlin artists we conceptualise and present projects from different cultural genres, such as visual arts, music, theatre, film and dance. Under the “shared experiences” motto we aspire to encourage shared conceptualization and realisation of artistic projects. Through the participation in our projects artists from both cities work together, experiencing different creative processes, learning from each other and entering into an exciting and fruitful artistic dialog. The “shared experiences” idea is central to our projects and we do not simply send a finished production to the partner city, but have different partner institutions from both cities working together on new projects. p.artners has initiated, organized, funded or supported 56 different projects in almost all different creative genres. 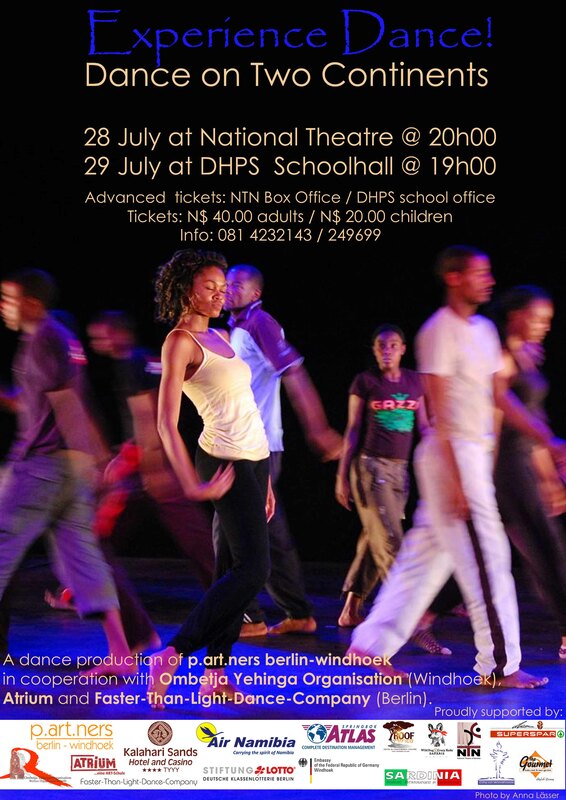 All this is made possible with financial support from the Stiftung Deutsche Klassenlotterie in Germany. Their funding covers the running costs of the project, ensuring the feasibility of organizing projects, but does not cover any direct project expenses. Another valuable sponsoring agreement has been signed with Air Namibia, ensuring significantly cheaper flights for participants of our projects. All other funding for projects has to be raised through additional sponsorship. The “shared experiences” project’s term is running till the March 2012. For the remainder of the time we would like to strengthen existing contacts and secure the sustainability of the project through encouraging more institutional involvement and support. Imke Rust initiated the idea of this project and together with Oliver Schruoffeneger founded p.art.ners berlin-windhoek. She has managed the project on the Namibian side from 2007 till 2010. In August 2010 Imke has resigned from her position as Managing Director of p.art.ners in order to again pursue her own art full-time. Initiated and organized by p.art.ners berlin-windhoek in close cooperation with partners from Germany and Namibia. 1 July 2007: p.art.ners berlin-windhoek registered as a gGmbH in Germany. 5 Apr – Dec 08 Short Film Competition Namibian Filmmakers are invited to enter scripts for a short film competition. The best 3 scripts receive N$ 50 000.00 for the production costs, plus they get a workshop with a “script doctor” to fine tune their scripts.The 2nd part of the competition is for the actual short films to be handed in, also short films which have been produced independently are accepted for this part. The winner of part 2 will be invited to attend the Berlinale in 2009, all expenses paid.The winner was announced on the 3rd of December: Mr Tim Huebschle with the film “Rider without a Horse”.DVD’s of the 3 funded short films have been produced and will be for sale.The official premiere of the films will be at the Wild Cinema Film Festival in 2009.